Home / General Discussion / Who needs a PMO? I was reminded of an old Monty Python sketch today. Did you ever see Life of Brian? Today, ‘Reg’ was a company CEO who is currently streamlining the business to increase profitability. On a sheet of A4 paper headed “Cost Centres” was a list and the third item on that list were the words “Project Management Office”. “Well, it aligned our IT and business strategies. Our IT is more business case focussed now,” declared the Finance Director. “… and culture. IT and the business are aligned culturally too.” added the HR Director. “And purchasing too.” added the Director of Procurement. “All IT Projects are on time and within budget.” said the CIO. He didn’t. He just crossed “Project Management Office” off his list and moved on. 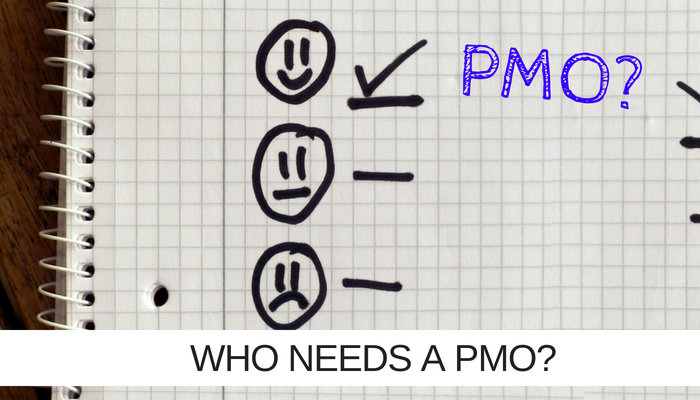 “Do we need a PMO?” is still a question I get asked a lot. Most businesses benefit from having one. Most recently, this question came from a business with departments that functioned as silos, each operating different IT systems with limited (or no) connectivity between them. This was an example of when the answer is a glaringly obvious “yes – you need a PMO”. It’s not always that easy to make the case for investment. Resisting the temptation to glibly say, “Can you afford NOT to have a PMO,” we explored the root of the question. Just like the CEO doing his Monty Python tribute act above, this business considered a Project Management Office as a cost. Some PMOs do generate income and as more businesses migrate to IT centred business models this will increasingly be the case. For now, though, the majority of PMOs will save money, drive efficiencies, improve communication, etc. These things are always harder to show on a spreadsheet than revenue! This firm runs IT projects with an increasingly significant cost attached to them and the impact of them is increasingly strategic from a business perspective. The bigger and more complex the projects you run are, the greater the return on your PMO investment will be. And yet, still, they questioned the financial logic. In the end, we came up with a solution via the Project Management as a Service route, through which individuals and teams or, in this case, end to end PMO can be accessed – as and when needed. If you are currently considering any significant IT projects or changes to your strategy through IT then it is definitely worth considering a strategically aligned PMO. The PMI’s 2017 Pulse of the Profession report demonstrated that firms with a PMO aligned with their business strategy had 38% more projects meet intended goals and satisfy business case than those that did not. They also report 33% fewer failures. Even Python’s Reg would find it hard to argue with those figures. So to answer the opening question, “who needs a PMO?” Probably, you do and thanks to the PMaaS market, you don’t have to add to your own headcount to get a fully functioning one!